Cookie dough has a special place in my heart. The very first thing I learned how to make was chocolate chip cookies. I’ve had my fair share of raw cookie dough in my days. Now, I know that there’s some concern about salmonella and such, so if you are worried about that, be sure to check out the notes in my recipe for a way to cook the flour prior to using it in the recipe. Chocolate chip cookie dough, peanut butter cup filling, and a chocolate ganache create three layers of no bake goodness. 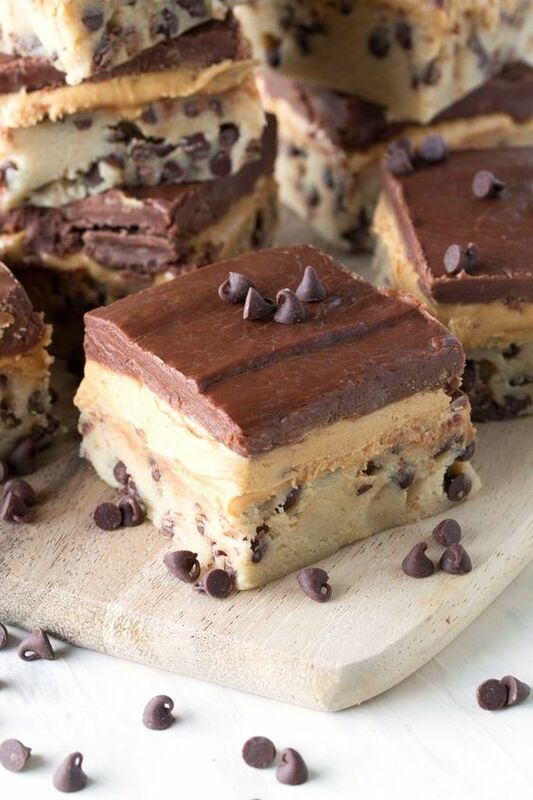 No Bake Peanut Butter Chocolate Chip Cookie Dough Bars are simply irresistible! Spray a 9x9 baking pan with nonstick cooking spray and line with parchment paper. Make the cookie dough layer by using a hand mixer to cream together butter and brown sugar in a mixing bowl. Mix in salt and vanilla. Slowly mix in flour and sweetened condensed milk, alternating between the two. Stir in mini chocolate chips. Press the dough into the prepared baking pan. Make the peanut butter layer by using a hand mixer to cream together peanut butter and powdered sugar in a mixing bowl. Gently spread the peanut butter mixture over the cookie dough layer. Make the chocolate layer by pouring the chocolate chips into a microwave safe bowl. For a softer chocolate layer, pour in heavy cream (optional). Microwave 15 seconds at a time, stirring in between, until chocolate is smooth and melted. Pour over peanut butter layer immediately and smooth out with a rubber spatula. Refrigerate for 4 hours before slicing and serving. 0 Response to "No Bake Peanut Butter Chocolate Chip Cookie Dough Bars"